Pacific Lutheran College places strong importance on developing relationships with the international community and aims to empower young people to become ‘global citizens’ with the knowledge and skills to be effective. The world is rapidly changing and the advancement of technology means that relationships are no longer bound by borders. At Pacific, we aim to make our students globally aware through a variety of academic, social and service programs. 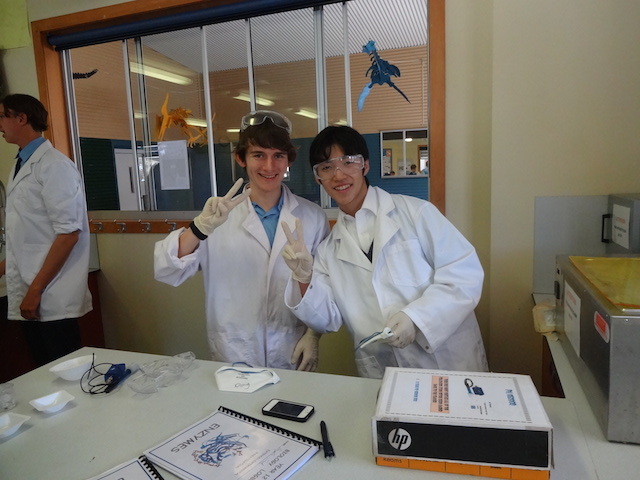 At Pacific, the Japanese language and culture is embraced from the Foundation College right through to Year 12. We are also fortunate to have Japanese Teacher Assistants to support our students on their learning journey. By having a native Japanese speaker on staff, students have access to authentic and personalised resources in their classrooms and have one-on-one time to communicate in Japanese and learn about the culture first hand. Pacific also has a sister school, Seishin Gakuen, located in Kashima City, Japan. Through this sister school relationship, students have the opportunity to participate in the biennial Japan Trip, while also welcoming Seishin Gakuen into the Pacific community every other year. Through the College’s service learning program, students are also exposed to the Cambodian culture and language, undertaking a biennial study tour to the region. The use of technology at the College also facilitates international relationships. At Pacific, video conferencing can be used to enhance classroom learning and assist in the development of strong relationships with the international community. Pacific Lutheran College supports development projects in Cambodia through Lutheran Church of Australia, International Mission (LCA International Mission) and Australian Lutheran World Service. Every two years, students in Years 10-12 have the opportunity to participate in a service learning/study tour to Cambodia. Leading up to the trip, team members learn about Cambodia, its history and culture, challenges faced by the people, poverty and sustainable development. The College community also raises funds to support development projects in Cambodia. During the trip, students spend time at the Lutheran World Mission Rainbow Hostel in Phnom Penh, which provides affordable accommodation and a supportive community for tertiary students from rural areas. Here, the students enjoy fellowship and build lasting relationships with the Cambodians who use the hostel. In order to learn more about Cambodia’s history, they visit the Tuol Sleng Genocide Museum, the Choeung Ek Memorial (the Killing Fields) and the temples of Angkor. During the trip, the team also meets with key staff at the head offices of a number of non-government organisations and social enterprises and learn from the people who work with the poor and marginalised. A particular focus of Pacific’s support is the Kampong Chhnang province. The team visits local primary schools and the Lutheran World Mission Life Centre in order to learn about the various projects Lutheran World Mission (supported by LCA International Mission) has established in Phum Krus and the surrounding area. Pacific continues to work in partnership with LCA Mission International to support development in Kampong Chhnang. Pacific Lutheran College and Seishin Gakuen officially formed a sister school relationship in November 2004. The purpose of the sister school relationship is to foster international awareness and broaden cultural understanding for the students and faculty of Pacific and Seishin Gakuen, through various forms of exchange and interaction. Having this unique link makes learning Japanese real and purposeful. Biennially, Pacific visits Seishin Gakuen and enjoys the warm hospitality of the Seishin Gakuen and Kashima City community. During the two-week tour of Japan, Pacific students attend Seishin classes and have the opportunity to attend club activities with their shadows and hosts. The trip also includes a home-stay program, which provides students with a valuable experience where they can completely immerse themselves in the Japanese culture. Pacific is proud to return the hospitality when Seishin visits Pacific and Caloundra City. Students to visit their school if they go on a Japan trip. Students to do home-stays with a student who they may have already spoken to via letters or emails. Students to make life-long friends with people abroad (for example contacting each other for birthdays, Christmas and other events). It may also lead to families meeting each other through privately organised holidays to Japan. In 2016, Pacific Lutheran College and Seishin Gakuen established a long-term student exchange program. The program involves one-term inbound and outbound student exchanges between the two schools. The establishment of this program will further enhance the relationship between Pacific and Seishin by providing opportunities for students to live and study overseas, deepening their language skills and cultural understandings. The program will also improve our relationship and ties of friendship with Seishin.